Much like the Muppet Babies or the teacher in Charlie Brown, parents and adult guardians seem to be missing from both the Mickey Mouse Clubhouse as well as Minnie's boy/girl, interspecies pajama party included in this disc. In any other television series, this could be a recipe for Gossip Girl-like behavior but luckily, the most controversial thing that occurs in the House of Mouse-- aside from the very annoying “Mouskertools” chant to fetch Toodles-- is Minnie's decision to bring math into the slumber party equation. After mentally dividing up the room like she was literally dividing up the pie she planned to serve her guests, Minnie, Daisy, Donald and Goofy settle into their pajamas and fortunately, they avoid a tacky trend and a Disney tradition by ensuring that Pluto the dog wouldn't be forced to conform to the sleepover clothing mandatory rule. Interacting with young viewers even before they opt to take advantage of the DVD's interactive game that can be played via a number of different skill levels, this adorably pink Minnie-centric disc encourages as it subtly educates through hyper-colorful surroundings and a number of opportunities for early learning problem solving. Yet logically the order of the quartet of episodes seems slightly out of place in a “what came first, the chicken or the egg?” like conundrum. Namely, the third tale introduces us to the world of bees that pollinate flowers and the fourth doubles back to the grand opening of a brand new picnic ground developed in honor of Mickey. However, luckily the target audience of this child-friendly FastPlay equipped roughly hundred minute DVD won't need a Mouskertool to set the fun plots right in their mind. Vividly animated to near 3-D like quality as the colors pop off the screen when played in both a standard disc or Blu-ray disc upconvert player, overall, it's the title episode about Minnie's new career as a small business owner that truly charms and gives us the disc's most engaging plot. Once more using the character of Pete to unexpectedly play on our sympathy and remind kids that we can't judge an animated animal on opinions (or previous Disney shorts), Minnie reminds us about the importance of friendship, support and respect when she assists Pete in finding the perfect bow-tie for his beloved aunt. Overall, it's best appreciated by the preschool set since it isn't quite as engaging as the superior and more innovative Handy Manny. 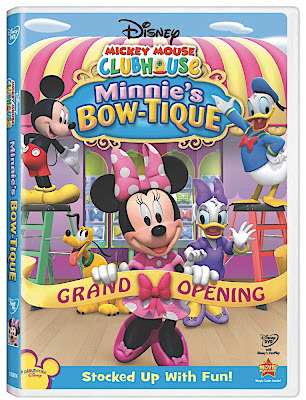 Likewise, while it's safe to say that older kids will be far more interested in Disney's wildly popular live action fare, nonetheless Minnie's Bow-tique is still a greater success than its previous Choo-Choo series release. And fortunately given both the disc's FastPlay and the innocence of a pie-themed pajama party, it's possible for adults to tune out just as much as the absent adults in the series itself who must live in an entirely different clubhouse.